A couple of months after first watching Safe and images keep resurfacing in my mind; Julianne Moore as the hypersensitive home-maker Carol White admiring her newly permed hair when suddenly her nose starts to bleed; then later, hyperventilating at a cloying baby shower while everyone else pours over the fresh plastic gifts; and finally, keeling over at the dry cleaners as the carpet is being chemically fumigated. What on earth is going on? Is Carol a delicate modern gal, being struck down like a canary in a coal mine by an as yet unidentified environmental disease? Or is she just a vacuous, bored housewife filling the gaping hole in her life with convincing drama? These are the questions that writer/director Todd Haynes has us ponder as we watch the cautious housewife meet with doctors and psychiatrists before finally checking in to a ‘safe’ clinic under the guidance of a self-appointed, self-help guru Pete Dunning (Peter Friedman). Here in the desert somewhere outside of Albuquerque, Carol retreats from the toxic world into a dubious kind of haven. As the devotees there sing syrupy folk songs about giving oneself to love, you begin to wonder what is worse; the symptom or the cure? Is Carol really saving herself from a destructive lifestyle or is she heading the same way as her fellow patient Lester, a tragic, neurotic cripple, afraid to even eat. 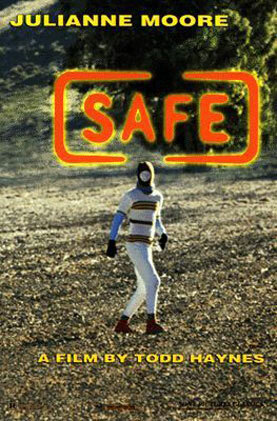 Safe is a strange, ambiguous, almost dreamlike film which is possibly why it was overlooked by distributors here for a full nine years. After the success of Haynes’s follow up films, in particular Far From Heaven which also starred Julianne Moore in an Oscar nominated performance, audiences were keen to see the director’s back catalogue so it was given a belated theatrical release. Now on DVD, the film can be viewed with an audio commentary from Haynes, Moore and producer Christine Vachon which gives a whole new angle on it. With this added information you understand how Moore’s subtle, minimalist performance is part of a complex narrative about a world that is turning against us. One way or another we may all be allergic to the Twenty-First century. Just pray you don’t end up like Carol White.